What is the best natural source of zinc to eat when dieting to ditch the multivitamin game all together? Eating seafood gives you the zinc you need. Foods high in zinc are hard to find. That's why most people resort to multivitamins to supplement their diets. Here are what foods are high in zinc so you don't have to. 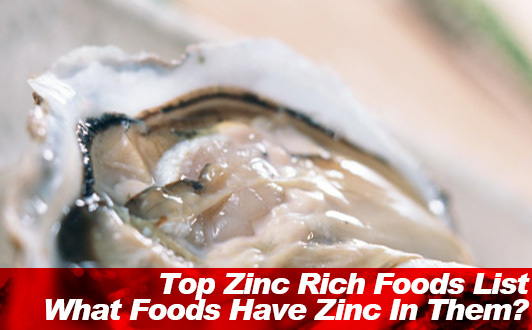 You won't find foods with higher levels of zinc. Eat zinc rich foods! What does your body use zinc for anyway? Zinc interacts with your body by helping out with protein synthesis as well as maintaining a strong immune system keeping you from getting sick, which means more time spent exercising. In addition, getting enough zinc in your diet is seen as a necessary preventative measure against lifestyle diseases. Not getting enough zinc may result in a zinc deficiency or a lowered ability to taste things. At it takes to keep your body from suffering through a deficiency or loss in ability to taste your food is getting a moderate amount of zinc in your diet. The recommended dietary allowance (RDA) for zinc is 12mg (for men between the ages 18 and 29) and 9mg (for women). Eating bellow the recommended daily intake of zinc can result in unwanted taste disorder, and dermatitis like rashes on your skin. In addition to the noticeable side effects of not getting enough zinc in your diet, a diet lacking zinc only beckons unwanted mental problems as well as lowered immunity levels. In the womb, the fetus is said to risk having growth slowed down as a result of the lack of zinc. Severe cases include low body weight upon being born which in can sometimes results in the baby being putt on life support. Lacking zinc in your diet increases the risk of developing related illness in the long run. That is why always making sure to get enough zinc in your meals has always been part of the balanced diet. Just when you started to worry about not getting enough zinc in your diet, there is zinc poisoning to worry about. Although when getting zinc naturally in the foods you eat, there should be no reason to worry about getting enough to overdose on zinc, however supplements including innocent multivitamins all contains zinc. Too much zinc in your diet may affect the nutrient absorption of essential nutrients such as copper and iron affecting your ability to balance your diet with nutrition. As stated above, zinc plays an important role in your body when it comes to protein synthesis and maintaining a strong immune system. Not getting enough zinc in your diet lowers your level of immunity increasing the chance of catching cold or other common illnesses that can occur as a result of a lowered immune system. In a balanced diet with ample amount of zinc in your diet there is no reason you should have to worry about the lack of zinc. However, when you go on a diet with strict eating restrictions, chances have it that you may be lacking zinc in your diet. In order to avoid zinc deficiency incorporating foods high in zinc in your diet will not only help you balance your diet but give you a stronger lifelong health perspective. Oysters are not called the milk of the ocean without reason. They are an excellent source of nutrition including zinc. They are commonly eaten raw, cooked, or fried up with other foods. Eating oyster helps prevent the taste disorder that comes as a side effect of lack of zinc in your diet in addition to having the effect of giving your healthy blood by way of its EPA content. In addition to being an excellent source of EPA, oyster has taurine to help lower your cholesterol. Surely, there is almost no comparison amongst healthy food coming from the sea. The calories in 1 oyster are low making an excellent food choice while dieting. There is a lot of seafood containing large amounts of zinc to eat. On the other hand, a similar animal product, meats serve as a stable source of zinc in your diet. In particular, red meat is said to be where the zinc is located. Just be careful because eating meats for the sole purpose of supplementing your diet with more zinc doesn't come without a price. Meats in general are not low in calories. Cod roe is harvested during the winter in Japan. Its eggs are said to make an excellent complement to white rice. Cooked Tarako is also eaten in certain regions. Zinc content is said to be at its highest when cod roe is cooked. When considering a sack of cod roe, it is low in calories. However, eating to much cod roe can turn high calorie fast. Eggs are a good source of high quality protein and minerals such as zinc. However, eating too many eggs is said to increase your cholesterol, which makes it one food you want to eat in moderation while on a diet. Red king crab is commonly found in the cold water currents of the northern island of Hokkaido, Japan in addition to other areas around the world such as arctic Alaska in the Bering Sea. Due to the fact that it only has 6 legs lead some people to be that it might not even be a crab. As a source of zinc, red king crab is a superb source. In particular, red king crab boiled in water is said to have the highest zinc content. Canned king crab is said to be around 90 calories per 100g serving size. Abalone is found all throughout Japan. It lives on seaweed and is considered high class seafood. The growth of abalone is said to depend solely on the water in which it is raised. Abalone raised in northern Japan is said to mature much slower than other places in Japan. Abalone is an exceptional source of zinc and protein that shouldn't be forgotten about when dieting. Getting more zinc in your diet to avoid deficiency! All you need to do to avoid that is incorporating some of the foods introduce in this column into your diet. Don't forget to exercise regularly.